“Chinese entrepreneurs are being both pushed and pulled into Africa. On the push side, China’s ascendancy in global manufacturing is now coming under structural pressure. A generation under the one-child policy has shrunk the country’s labor pool, causing shortages in its coastal manufacturing hubs. And labor costs have risen sharply in recent years: Hourly manufacturing wages have increased by 12 percent annually since 2001, and productivity-adjusted manufacturing wages nearly tripled from 2004 to 2014. For the sake of the developing world, I wish this were true. 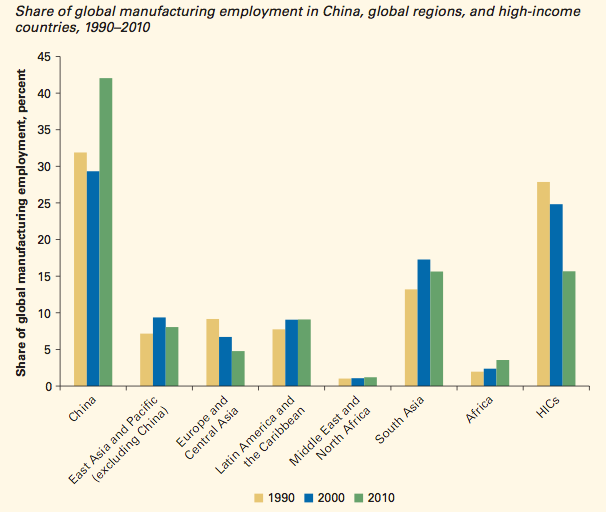 The World Bank recently published a detailed report on the future of manufacturing, ominously titled “Trouble in the making?” Figure 1 shows two charts from the book. 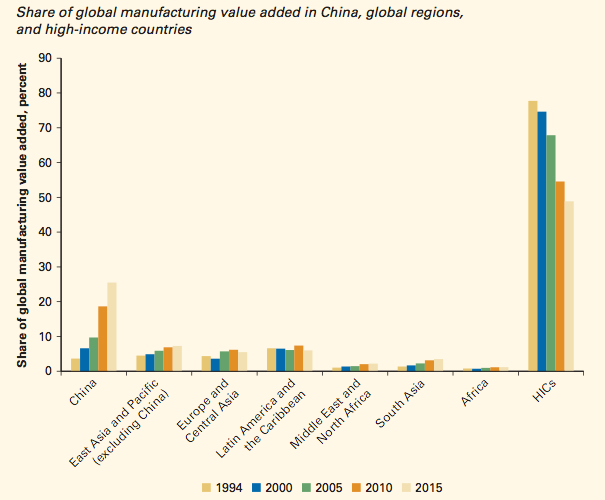 The top chart shows that in 2015 money from manufacturing was split 50-50 by high-income economies and the developing world. China’s share was half of the latter and still growing. The rest of Asia was 10 percent and rising. Africa barely registered. If you care more about jobs than money, the bottom chart is more encouraging. In 2010, manufacturing jobs were split 15-85 between high-income and developing countries, with Africa’s share rising until 2010. But so was China’s share. Labor costs are even lower elsewhere in Asia: They were 4.5 percent of the U.S. cost in India (and steady), 6 percent in the Philippines, and 16 percent in Turkey. Costs in Vietnam are likely to be closer to India’s than China’s. In Latin America, it is 16 percent (and falling) in Mexico and 21 percent in Brazil. The reason for the ostensive rise in China’s labor costs is the belief that its workforce is shrinking rapidly. But a closer look at China’s demographics would make you think again. The alarm is about dependency ratios, which are indeed projected to rise. But what really matters for the subject at hand is the size of the workforce, not the number of elderly Chinese. The U.N.’s population estimates indicate that the population aged 15-64 will be a billion in 2025; in 2050 the number of Chinese aged 15-69 will still be almost a billion. Don’t bet on China giving back manufacturing jobs any time soon. There is one scenario in which this could happen: If manufacturing wages in China rose to levels close to those in high-income countries. Of course, this would also likely mean that Chinese productivity would also have risen a lot, and under plausible assumptions, that in turn would mean that much fewer manufacturing workers would be needed to fulfill global demand for manufactured goods. Either way, for the slow and late industrializers in Latin America, South Asia, and Africa, trouble is indeed in the making.